Look at the pictures below and tell what do you see? Those cars are on the wrong side of the road; driven by people just because there is a line of traffic in their way. Driving in Dubai, no wait, U.A.E., is pretty much one of the most frustrating experiences for those who have good manners and common sense. The levels of arrogance is about the size of Texas. I recently came across this article and I found it so accurate that I actually chuckled. I actually felt like clapping my hands at the fact that someone had the good sense to post such an article. I thought of doing it myself and it looks like some else beat me to the punch. Frankly did it very well. I love the sarcastic tones. Those in the U.A.E. will no doubt be familiar with everything mentioned in the article. You’ll also notice that many times, these offenses are done by cars with the red and white number plates. 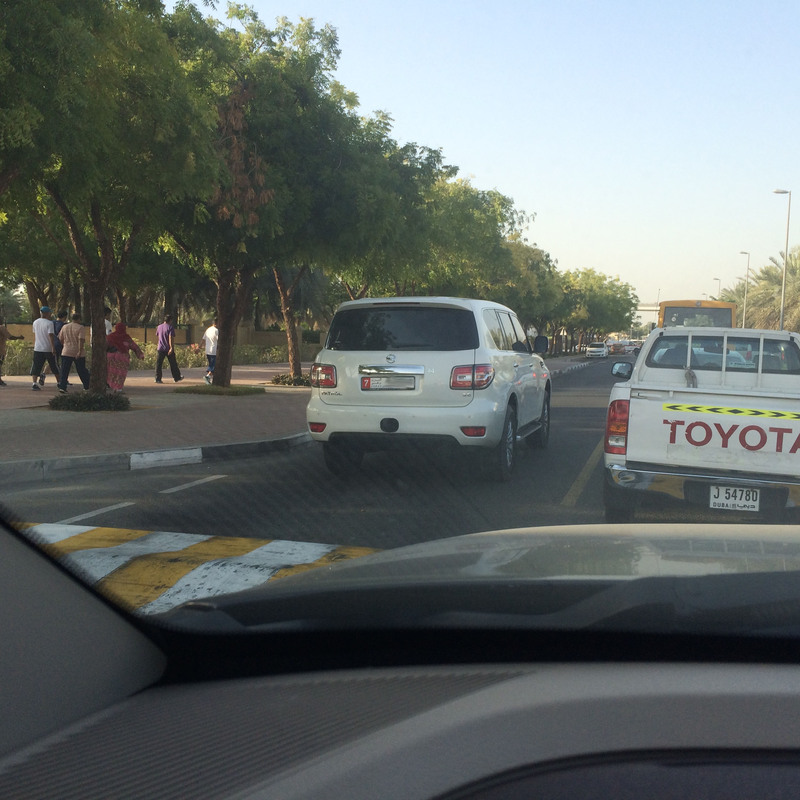 Those plates mean that those are cars from the capital, Abu Dhabi. 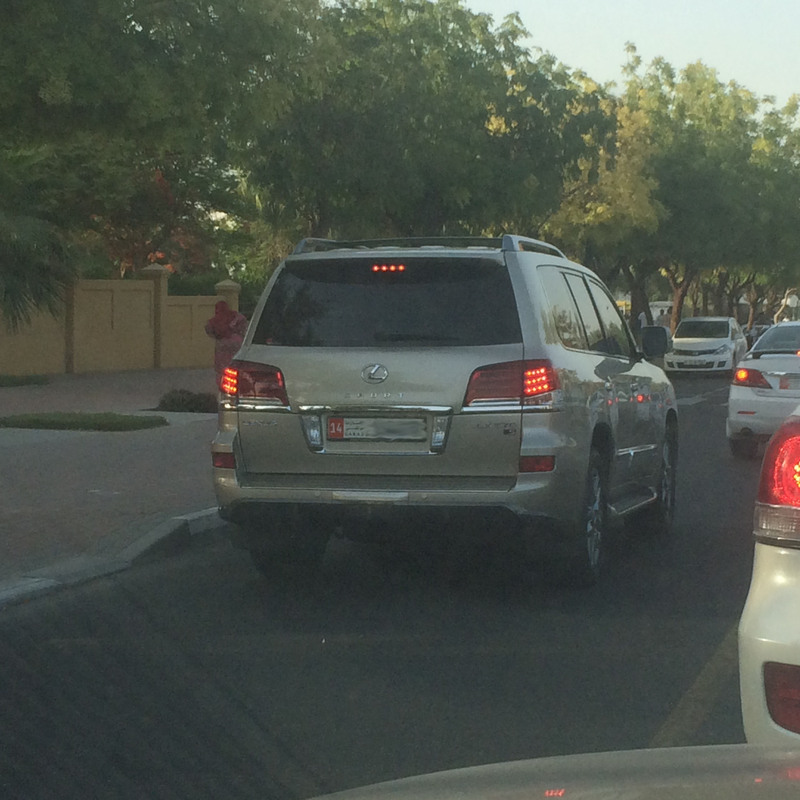 When driving here in Dubai, if you see a car with one of those plates, you can bet a million USD that driver will do something completely crazy and stupid and 96% of the time, you’d win. #Truth. I once witnessed someone cut in front of an ambulance, blocking it, just because the queue at the signal was too long. Apparently the life of the patient inside wasn’t important enough to the Lexus driver. In the pictures above, I saw cars who, have the right of way, turning aside and park; just to let these selfish morons through. From the speeds they were driving, it seemed they were prepared to ram a vehicle head on; if it didn’t move out of the way fast enough. What is even more interesting is that on the day the pictures above were taken, a police officer was seen writing down tickets for all the offenders. Would you like to guess how many offenders were there the next day; at the same time and place..? I’d wager the same. The number was exactly the same. The same cars and same individuals just carried on. This time there was no police officer to catch them, but I was amazed that the fines they received, did not faze them nor stop them from shamelessly breaking the law. One can only assume that they are not worried for two possibilities. Neither of which are far fetched at all. 2. They have someone on the force with the ability to wipe the fines off the system. There is also considerable discrimination when dealing with offenders. One can only assume that the owner of the car in the above articles was a local. Otherwise it would not have been raised to such a level. An expat in the same position would probably have been heavily fined. 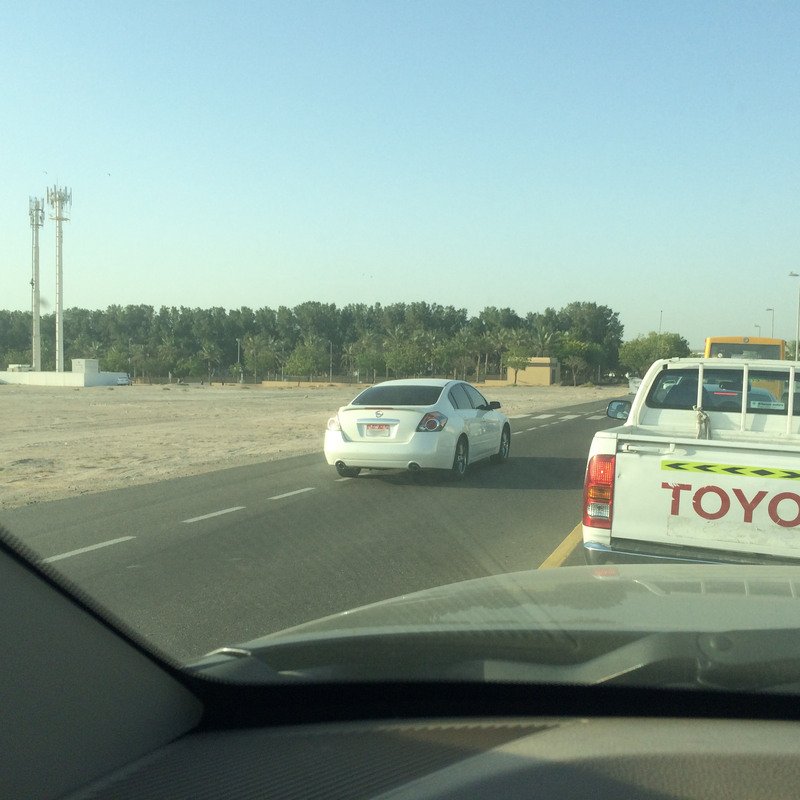 This blatant disregard and discrimination for road rules, safety and this selfish arrogant behaviour has earned the U.A.E. a reputation for some of the most dangerous roads in the world. Why? It is not like the roads are horribly designed or anything. It is not the roads; it is the people; the drivers and users. 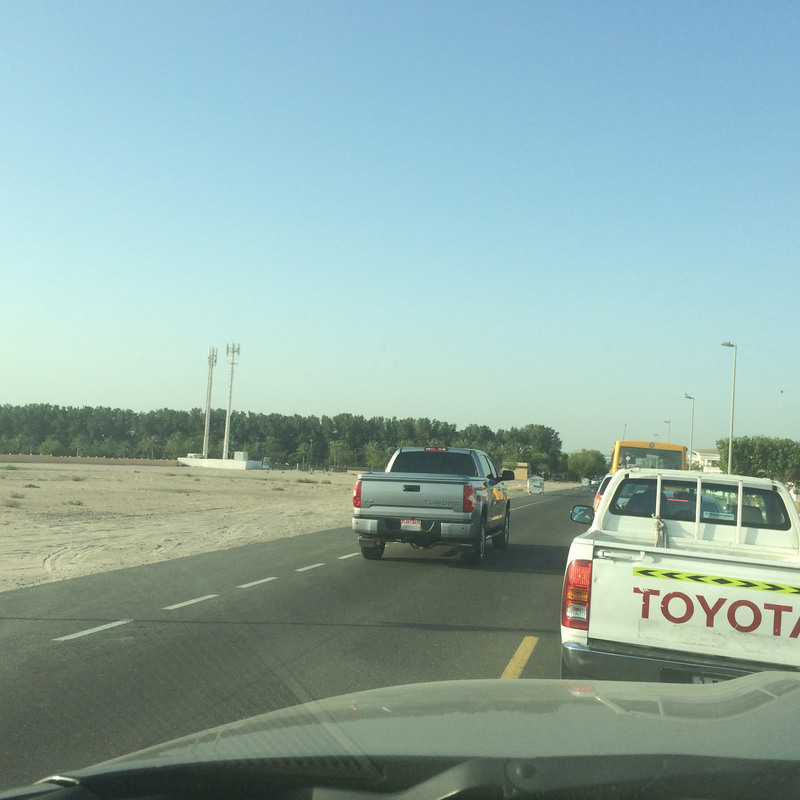 Most of the traffic in the U.A.E. is senseless. It can all be avoided if people obey the rules, queue accordingly and are considerate of one another. But the fact is, that while the sane human being with common sense of decency will be gracious enough to comply, most will not. The actions of those simple minded, selfish people would have you sitting in traffic for hours; just because they deem themselves too high to have to need to queue up like the rest of us. More often than not, you need to follow the lead of imbeciles; if you ever hope to reach your destination on time. The phrase, “If you can’t beat ’em, join ’em”, come to mind. To be honest, I’d rather have a metal stake through my eyes than follow suit. If I have to sit at one spot in traffic for the rest of my life, I’d rather do that than join in. Those that do, Murphy’s Law will soon imply. Trust me on that. 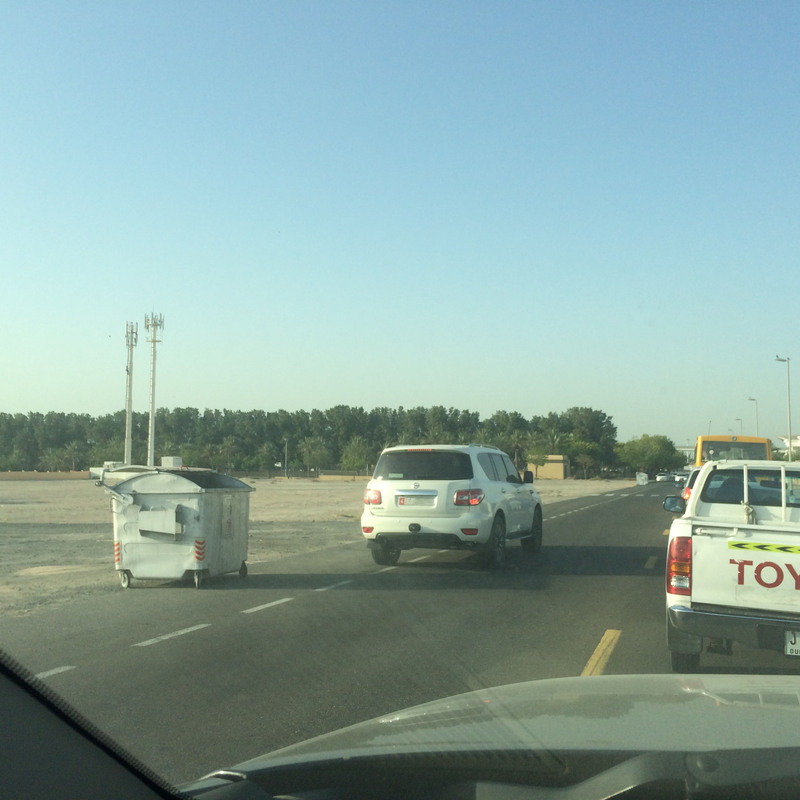 This is the reality of driving in Dubai. One can only assume that soon the Mad Max style of Road etiquette is sure be the norm and by the looks of things, common sense, consideration and decency isn’t coming back anytime soon; assuming that it was ever there in the first place.